Other common names: Snapping hazel, winterbloom, wych-hazel, striped alder, spotted alder, tobacco wood. Habitat and range: The home of this native shrub is in low damp woods from New Brunswick to Minnesota and south to Florida and Texas. Description: This shrub, while it may grow to 25 feet in height, is more frequently found reaching a height of only 8 to 15 feet, its crooked stem and long forking branches covered with smoothish brown bark sometimes with an addition of lichens. 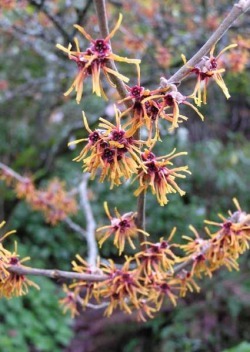 A peculiar feature about witch-hazel is its flowering in very late fall or even early winter, when its branches are destitute of leaves, the seed forming but not ripening until the following season. The leaves are rather large, 3 to 5 inches long, thick, and borne on short stalks; they are broadly oval or heart-shaped oval, sometimes pointed and sometimes blunt at the apex, with uneven sides at the base, and wavy margins. The older leaves are smooth, but when young they are covered with downy hairs. The upper surface of the leaves is a light-green or brownish-green color, while the lower surface is pale green and somewhat shining, with prominent veins. The threadlike bright-yellow flowers, which appear very late in autumn, are rather odd looking and consist of a 4-parted corolla with four long, narrow, strap-shaped petals, which are twisted in various ways when in full flower. The seed capsule does not mature until the following season, when the beaked and densely hairy seed case bursts open elastically, scattering with great force and to a considerable distance the large, shining-black, hard seeds. This interesting shrub is a member of the witch-hazel family (Hamamelidaceae). Collection, prices, and uses: Witch-hazel leaves are official in the United States Pharmacopoeia. They should be collected in autumn and carefully dried. Formerly the leaves alone were recognized in the United States Pharmacopoeia, but now the bark and twigs are also official. The leaves have a faint odor and an astringent, somewhat bitter, and aromatic taste. They bring about 2 to 3 cents a pound. The soothing properties of witch-hazel were known among the Indians, and it is still employed for the relief of inflammatory conditions.